Walter was born in Rugby in 1895 and christened at St Andrews Church on 13 July, the son of Walter John Saville and his wife Florence nee Cornah. His parents were married at the same church on 19 Aug 1890, he was 29, a builder’s clerk, son of Thomas Saville, also a builder’s clerk. Florence was 24, living in Cambridge Terrace (now Cambridge Street) off Clifton Road, and daughter of William Cornah, a coachbuilder. In 1901 Walter John born in London and Florence born in Rugby were living at “Mayfield” in Clifton Road with two children, Walter junior and Sidney Foster, born the previous year, and a servant. By 1911 they were at 93 Clifton Road (which may be the same as “Mayfield”), a large house with eight rooms. They had been married for 22 years, and had four children, all living. By this time Walter senior was a builder and contractor and an employer. The Rugby Advertiser tells us that he was “of Foster & Dicksee”. Two daughters had been added to the family, Florence Eugenie aged 8 and Lilian Hall aged 5, there was also a servant. Soldiers of the Great War tells us that Walter enlisted in London and joined the Honourable Artillery Company (HAC) as Gunner no 624146. The account of his death in the Rugby Advertiser on 13 October 1917 gives a brief obituary of Walter. He was a very tall man, he attended Murray School and Lower School (Lawrence Sheriff), and was a keen golfer and cricketer. He joined the HAC in October 1914 at which time he was employed by Foster & Dicksee. He was stationed chiefly on the east coast for home defence, but went to France about four months before his death on 29 September 1917 when he was serving with the 2nd Artillery Battery. He died of wounds in the same dugout as Leo Lennon (qv) when it was hit by a German shell. Walter is buried in Bard Cottage Cemetery near Ypres. He was awarded the Victory and British War medals, his mother received his back pay and a war gratuity of £13. His father had died in 1915. He is remembered on his parents’ gravestone in Clifton Road Cemetery and on the Old Laurentians memorial plaque as well as on the Rugby Memorial Gates. Lionel (Leo) Lennon was the youngest of the five sons of John Patrick and Mary Charlotte (nee Cornish) who were married in Chelmsford Registration District December Quarter 1887. Their four eldest children were born there too, John William (1888), Ernest Patrick (1889), Edward James (1891), and William Thomas (1893). In 1891 John was a baker living with his wife and three oldest children at “The Bird in Hand” in Baker Street, Chelmsford. He was born in Hertfordshire and his wife in Sussex. The Lennons moved shortly after this to the “Six Bells Inn” in Cockfield Sussex where Lionel was born in 1894. His father was now termed a licensed victualler, and at last the couple produced a daughter, Mary Ann, born in 1897. By 1904 the family was in Rugby where sadly their eldest son John William died at the age of 15. In 1911 they were living at “The Globe Hotel” in Railway Terrace with two servants. Ernest, Edward and William were employed as barmen by their father, Lionel at 17 was still at school at Lawrence Sheriff. Lionel was one of the partners in the well-known local firm of Lennon Bros, tobacconists, which operated from adjacent premises and other sites in the town, and which many Rugby people will remember. Lionel joined the Honourable Artillery Company (HAC) in January 1916 as Gunner 624555. The Rugby Advertiser of 13 October gives an account of his death on 29 September. He was killed together with his fellow townsman Walter Stanley Saville (qv) while they were resting in a dugout after a heavy artillery engagement. A German shell landed on the dugout killing him instantly, Gunner Saville was seriously wounded and died half an hour later. 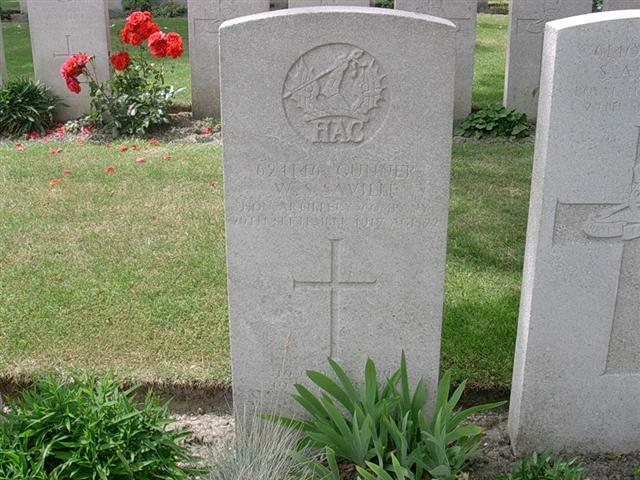 Lionel’s brother William, who had also joined the HAC (no 624559), had shared the dugout with the two men, but shortly before had been sent up to the waggon lines, thus escaping their fate. Lionel’s eldest brother Ernest also belonged to the HAC (no 625659) but was later transferred to the Royal Field Artillery. Brother Edward may be the Edward J Lennon who joined the Royal Army Medical Corps (no 42466) and was sent to France on 19 July 1915 (medal cards). All four brothers received the Victory and British War medals, Edward also had the 1915 Star. He died in 1922. John Patrick died in 1927 and Mary Charlotte in 1944, both of Moultrie Road. Lionel is buried in the Divisional Collecting Post Cemetery to the north east of Ypres, which was begun by field ambulances of the 48th and 58th Divisions in August 1917 and used until January 1918. The cemetery was extended in the early 1920s for burials brought from surrounding battlefields and small burial grounds in the area. On the grave register, his parents were of 15 Moultrie Road, Rugby. He is also remembered on the Old Laurentians plaque at Lawrence Sheriff School, and on the Roll of Honour at St Marie’s Church. Ernest George Bradshaw was born in 1880 in Rugby. The family was living at 18 Round Street at the time and his father John was a carpenter. John Bradshaw had married Mary Ann E Farden in 1875. The wedding was registered in the Daventry RD. John came from Napton on the Hill , Warwickshire and Mary Ann from Byfield in Northants. By 1891 the family had moved to 8 Newbold Road. Aged ten, Ernest was the middle of five children: John (15), Mary (12), Ada (8) and Frank (1). By 1901 Ernest was following in his father’s trade as a carpenter’s apprentice. He worked for Rugby builders, Foster and Dicksee. On 20th May 1907 married Eliza Ellen Jones at Church Lawford Parish Church. He was aged 27 and Eliza was a 30 year old domestic servant. Their only child George Edward was born in late 1910. The family lived at 39 Wood Street. Ernest George Bradshaw was working in Brownsover when he joined the army in June 1916. He enlisted in 2nd/6th Bn. Royal Warwickshire Regiment (Private, no. 242340) and arrived in France around October 1916. The RWR was in the final stages of the Battle of the Somme. In 1917 the regiment was part of the 61st (2nd South Midland) Division in operations on the Ancre in March and The Battle of Langemarck in August 1917. On 23rd September 1917, after several weeks of training, the Battalion relieved the 10th Bn Sherwood Foresters as right Battalion in the Chemical Works Sector (Ref. map Flouvain). At 4.30 a.m. the enemy attempted a raid on the trenches of our centre Company. An intense barrage composed of T. M. Shells of various calibres 77mm. 4.5 cm and 5.9 cm was put down on line CORFU AVENUE and thence along COLUMBO SWITCH. An S.O.S. signal, which appeared to have been fired from our extreme right flank, was observed. The Artillery were informed and promptly fired on their S.O.S. lines. At the same time, movement was observed in front of our own wire at I.14.c.6.9., and rifle and Lewis Gun fire was opened. One of the enemy who succeeded in crawling through a recognised gap in our wire was hit by Lewis Gun fire and taken prisoner. Nothing more was seen of the enemy and no attack developed. The Barrage continued with intensity till 5.15 a.m., at which time it commenced to diminish slightly. At 7 a.m. all was reported quiet. A patrol was sent out at dusk the same day, to the supposed place of assembly of the enemy raiding party, but no wounded or further identifications could be found. Our casualties 8 other ranks killed, Capt. B. R. Saunders and 3 other ranks wounded. 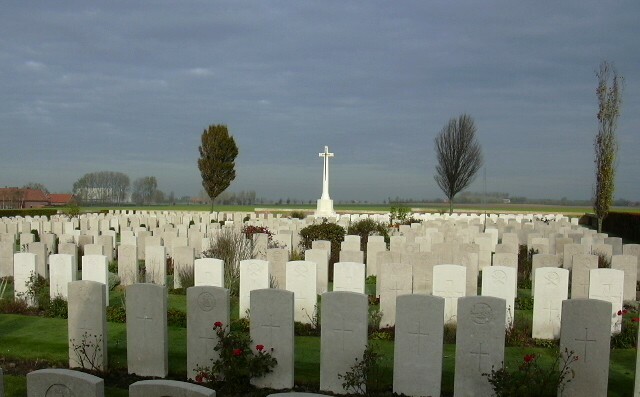 Plots I to IV are composed almost entirely of graves cleared from the battlefield in the summer of 1917. The Germans re-entered the village at the end of March 1918, and it was finally retaken by the 51st Division on the following 26 August. Eliza never remarried, dying in 1950. Their son George Edward Bradshaw was living with her at 76 Oxford Street, Rugby, in 1939. George senior was working as a blacksmith in an engineering works in Rugby in 1911, and living at 15 Manor Road, a house with seven rooms. He had moved to the town around 1899; his five youngest children were born here. He had travelled around quite a bit according to the birthplaces of his children, from Farnham in 1887 to Aldershot c 1893 where George jnr and Victoria were born, then to Flore Northants for a couple of years, and on to Weston by Welland for another couple of years before coming to Rugby. In 1901 the family with six children were living at 33 Arnold Street (RG13/2916/76). This would have been in the early days of the engineering companies in Rugby, which would have recruited men with experience like George. George John was a carpenter’s apprentice in 1911, working for a builder. His two older sisters (Harriet) Maude and Elizabeth were workers in a lamp factory, and a younger brother (Alfred) Jesse was an iron turner’s apprentice in an engineering works. Five of the six youngest children aged 4-13 were scholars, the youngest was an infant aged two. George must have enlisted during the first year of the war as his medal card records that he was awarded the 1915 Star having entered France on 21 July 1915. He is buried in Spoilbank Cemetery five miles south of Ypres which contains 520 graves and commemorations of the fallen. His grave in Section I, row O is directly beside the path between the main gate and the Great Cross. He married Doris M Meek in Mar Qr of 1917 in Rugby RD.